The New Mutants are transported to a strange world built around personifications of media. Upset by the horrible state of the world she sees on TV, Rahne runs outside, chased by Boom-Boom, only to discover the nearby river is horribly polluted. Overhearing them, a group of local children resolve to clean up the river. 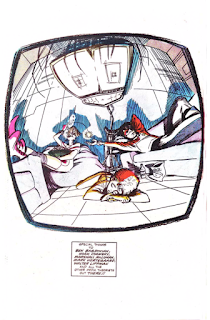 Meanwhile, the TV-obsessed Warlock picks up what he believes to be a new TV channel, but is actually a signal generated by the alien Vidiot, who proceeds to transport Warlock, Boom-Boom, Rahne and Roberto into a strange world inside the TV. 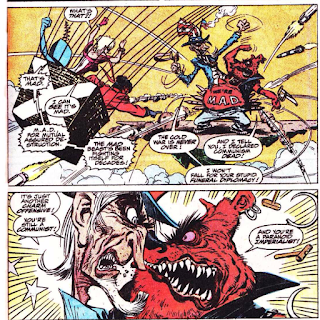 The New Mutants are immediately bombarded by personifications of media theorems like situational ethics, mutually assured destruction, and constant, blaring advertisements. Eventually, they journey to the center of the world, a city named Megalopolis, and help oust the leader, the Mediamogul, thereby freeing the people of Megalopolis. Back on Earth, the local children stage a sit-in at the river, creating enough of a spectacle to attract the local news, which then forces the company which polluted the river to clean it up in the name of publicity. 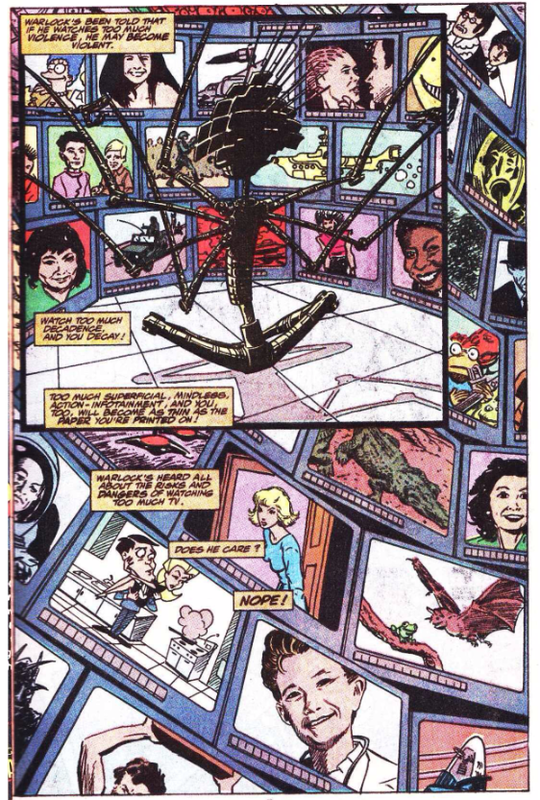 Returning home, the New Mutants gather up their TVs and prepare to destroy them but, learning how the kids were able to use the media to clean up the river, they relent. Conflicted, the New Mutants ultimately decide to keep their TVs, if only to keep watching their favorite show, Twin Peaks. 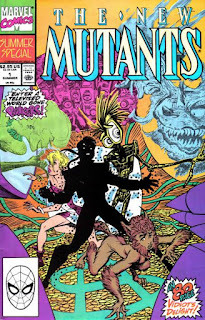 A special one-shot published in May of 1990, alongside the regular New Mutants Annual for the year, I have no idea what the impetus for this issue was, if it was something writer Ann Nocenti pushed to do, or if Bob Harras just wanted some more New Mutants material on the stands . 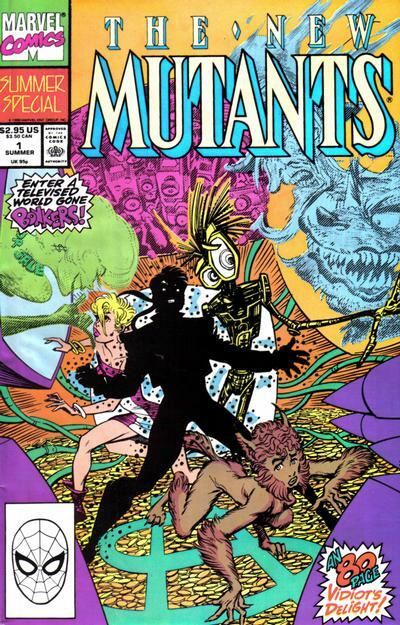 Either way, it's a strange beast, essentially a bit of socio-political commentary by Nocenti masked as a fun, breezy summertime story featuring the New Mutants. 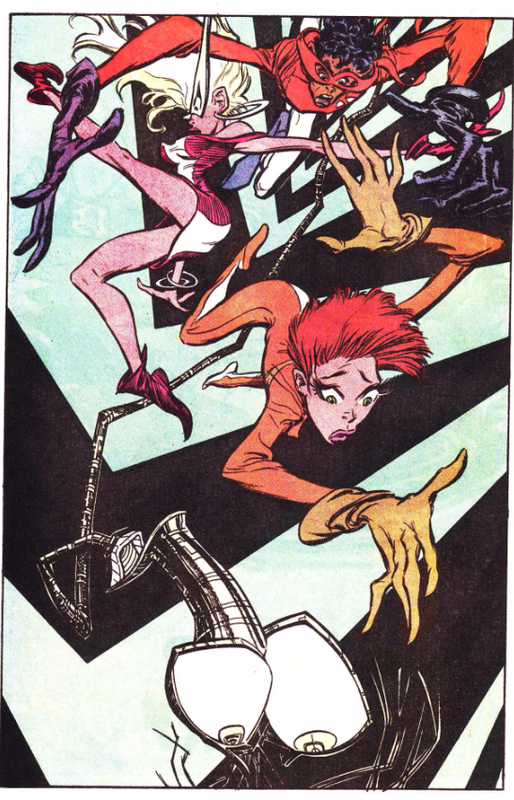 Former regular New Mutants artist Bret Blevins returns to draw the issue, and whether it's because he connects with the material or is just free of the grind of a monthly book, the art is much stronger than it was towards the end of his run on the main series. The issue ends with a series of pinups by Blevins, as well as a thank you to a variety of media theorists. 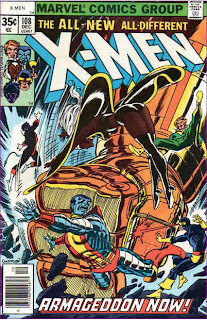 This issue takes place after "Days of Future Present" and before the framing sequence in New Mutants #92. Cable, Cannonball and Rictor do not appear in this story. Roberto apparently sleeps in his New Mutants uniform. The depiction of media over-saturation is probably as accurate today as in 1990. Ditto the notion that the news is more concerned with ratings-driven spectacle than actually reporting stories. 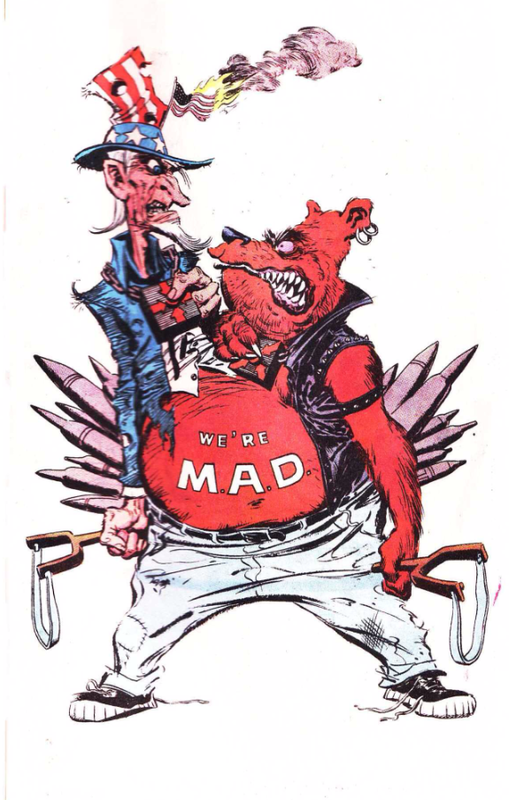 At one point, the New Mutants encounter a two-head being, one side Uncle Sam the other a Soviet bear, battles over their respective ideologies, with representations of Third World nations getting caught in the crossfire. Warlock's wall of TVs features references to numerous TV touchstones, including The Simpsons, Roseanne, Whoopi Goldberg, Doogie Howser, and Bewitched. On of the officials in Megalopolis is named Moopert Rurdock; clearly, Nocenti burned a lot of brain cells coming up with that pastiche. The media-controlled president resembles President Bush the Elder. Having never read this issue before, I wasn't quite sure what to expect from it. Whatever it was, it wasn't what I got, which is a (very) thinly veiled discussion of media theory, covering everything from the impact of TV on society, to the influence of corporate interests on media, to political science and global economics, to environmentalism and armchair liberalism. 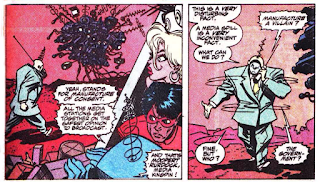 "Discussion", though, is perhaps too strong a word, as Nocenti, a writer known for using superhero tropes as a vehicle for her socio-political views, barely makes the effort to disguise her intentions via the adventures of the New Mutants here; it's less a discussion than a presentation of some her thoughts and ideas on the state of the media, like she just read a Noam Chomsky (credited in the issue) book and decided to share these brilliant ideas with the world. 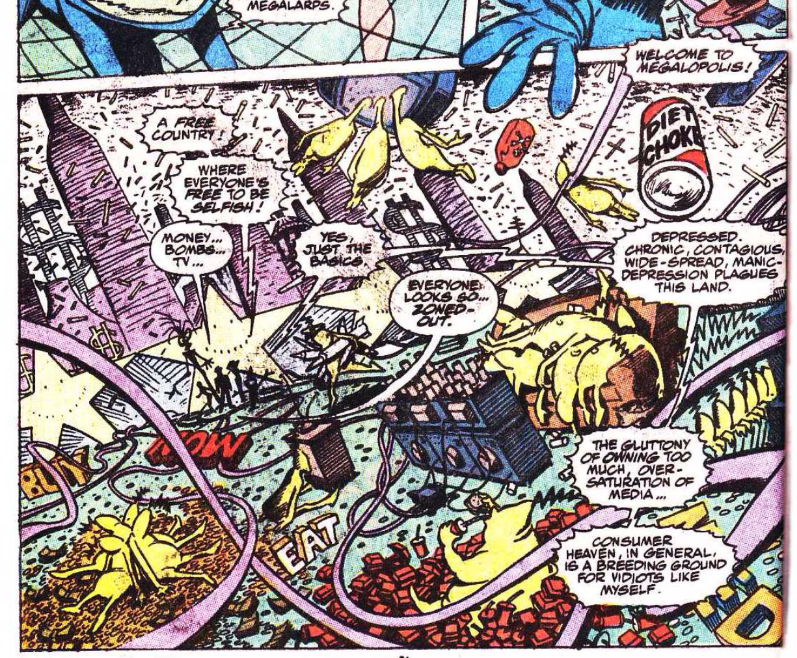 Megalopolis is basically Mojoworld, stripped of the fantasy/comic book trappings that make it a metaphor, less the setting of a story than the setting of a series of political cartoon. And, as a thinkpiece, it's fine, I suppose. A dash (or more) subtlety would have been nice, and it's unclear what reason, if any, the New Mutants were chosen as the ostensible vehicle for this "story" (other than that they're teenagers? ), but these are clearly issues that have been eating away at Nocenti, that she felt compelled to bring to light, and even if they aren't the most original, and even if she doesn't so much engage them as just drop them out there, like she's the first person to realize that ratings drive the news, it is telling that, for all the dated pop culture references in this issue, the criticisms about media and politics that Nocenti is putting out there are, sadly, as relevant today as they were in 1990. The one area where Nocenti at least does try to complicate things, at least, is in the running subplot involving local children staging a sit-in to protest the pollution of a river. Determined to make a scene in order to draw the attention of the news, and thus use the flaws of the media to their advantage, it's the quiet counterpart to all the noise going on in Megalopolis, the idea that the media's obsession with ratings and money can be used to the advantage of what we'd today call social justice warriors. Again, it's not the deepest or most original of points, but it is the deepest and most original point in this issue, and the scenes with the local kids in the river make for the best part of the story (those scenes also feature the best Blevins material, as he tones down the manic energy, allowing his skill for visual characterization to shine through). Maybe this read differently in 1990, when more of the ideas espoused here were, if not groundbreaking, at least a little more eye-opening than the "well, duh!" they elicit now. And while Nocenti should be commended for trying to make a statement, it's still questionable whether this was the best vehicle for it, a one-off quasi-annual starring characters with a tangential (at best) relationship to the points Nocenti is trying to make. For all her (presumed) good intentions, the issue ultimately reads like a bad play written by an earnest high schooler, one where the goal isn't to entertain or educate the audience or create a dialogue about the issues, but rather, simply to inform the audience that the author is aware of/bothered by the issues presented in the piece. Tomorrow, Wolverine #27. Next week, Uncanny X-Men #265 and New Mutants #92. Richard Meyer: Did you ever get in trouble for being such a liberal (again for the record, I'm pretty conservative but I still loved your stuff)? 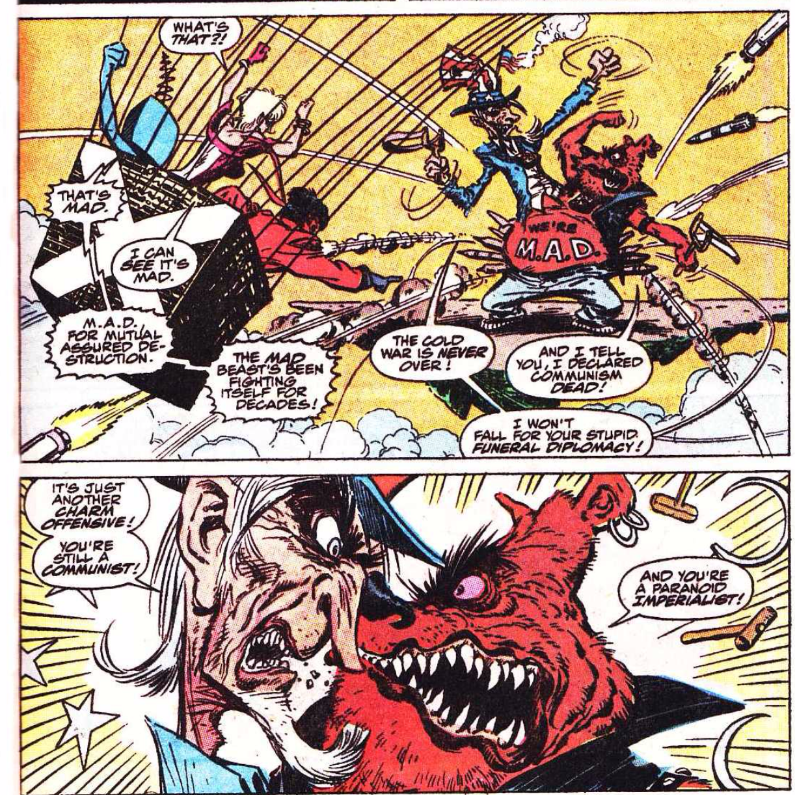 Ann Nocenti: I remember after a Captain America story we got a letter that said, "Get the commie off the book." We had a big laugh about that one. Luckily, I had an enlightened editor, Ralph Macchio, so while we had lots of fun conversation about the issues, and he often disagreed with my politics, he let me do what I wanted. He was an extremely supportive and intelligent editor. 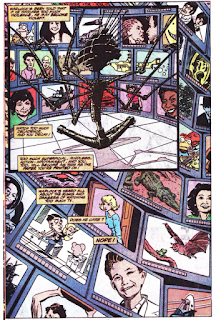 I also remember once I wrote a New Mutants story about media conglomerates, and the higher powers at Marvel got wind of it before it went to press and cut the print run (uncomfortable with the fact that they were the very thing I was critiquing). So the story was suppressed and not seen by many, but I did get a wonderful letter from Noam Chomsky, the great writer and guru of media analysis, so I was thrilled. I guess that print run cut explains why this never hit my radar. While this sounds like one of the occasions when I kind of agree with Nocenti's overall point, it still feels like one of her "message" stories - someone barging into a random room and shouting "I've got something to say!" regardless of the mood of this proverbial room. Never heard of this. It looks like something I would like. Screw subtlety! Whew... 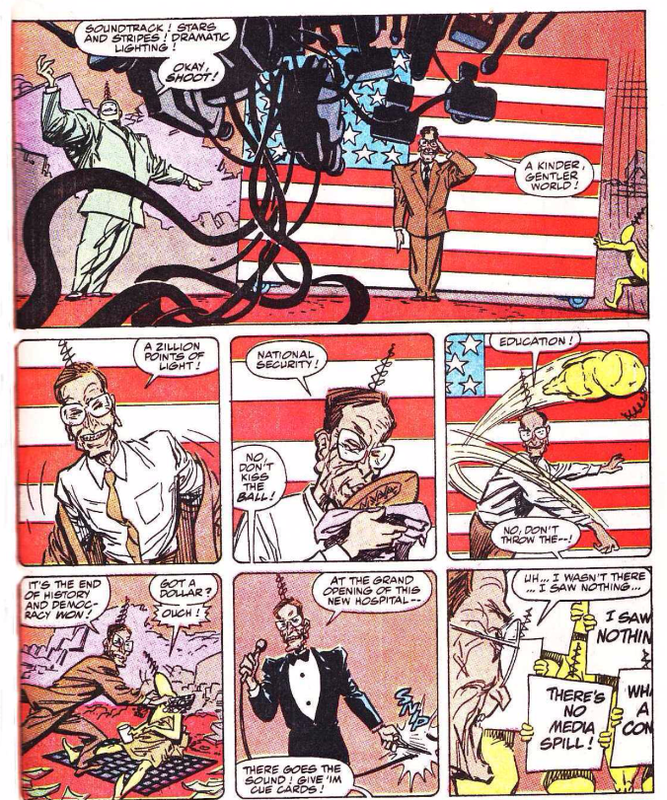 I got seized by a sudden fear while reading the issue that you might actually try to synopsize it in the style of Nocenti’s breathless captions. So thanks for avoiding that. After she blows up a fly right in front of her wide-eyed face. Not sure I’d want to do that if I were Boom-Boom — I wouldn’t really want to blow up a TV, either, but I think at least that’s more in character for her. Oy. 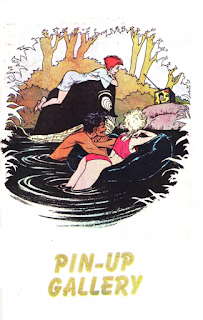 I know this was allegorical ’n’ stuff, but the New Mutants’ otherdimensional excursion lasted only an instant yet the kids on Earth got the river unpolluted by drawing the media’s attention. The kids being depicted in black-and-white until the end confused me, too, since contrary to what I assumed for most of the story they didn’t turn out to be aliens or psychic manifestations or something like that. His antenna limb is strong enough to shoot straight through several floors of the mansion and long enough to rise well past Earth’s atmosphere with not just little apparent effort but unbelievable speed. I guess unstable molecules are pretty darned comfy if you can flop down in your mask, gloves, and boots for a nap. 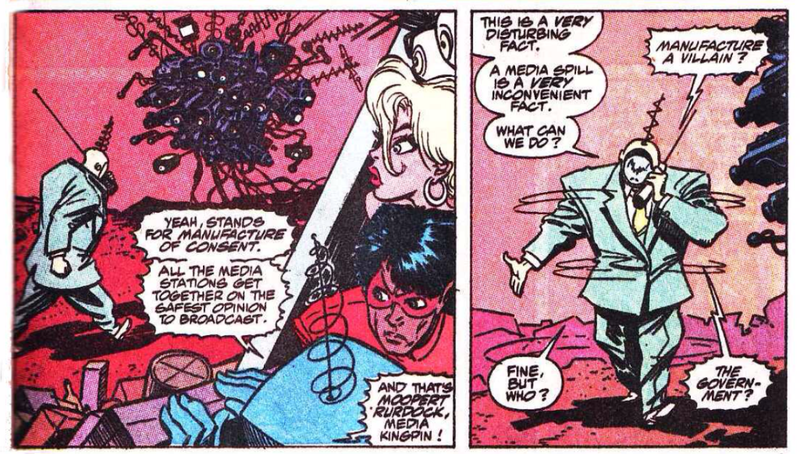 Nocenti isn’t wrong but she’s awfully earnest. I am curious what I’d have thought of this had I read it when published. Yeah. The opening captions, while a bit too… something, are sadly remarkable — or sadly unremarkable, maybe — in that they don’t really get anachronistic until the words “rock video”. Well, as Mela said, that explains why this book flew under the radar/rarely gets mentioned. A slashed print run and suppression by the publisher'll do that. @Mela: While this sounds like one of the occasions when I kind of agree with Nocenti's overall point, it still feels like one of her "message" stories - someone barging into a random room and shouting "I've got something to say!" regardless of the mood of this proverbial room. That's pretty much it in a nutshell. I mean, I don't disagree with what she's saying, more the way she's saying it, in that it can't be the most effective way of making her point. @Jason: Never heard of this. It looks like something I would like. Screw subtlety! If you ever do read it, let me know what you think. The lack of subtlety is probably one of its lesser problems. @Blam: Whew... 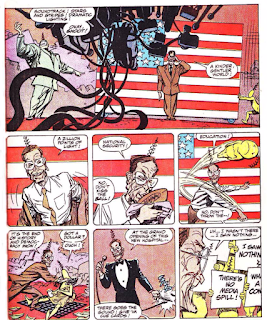 I got seized by a sudden fear while reading the issue that you might actually try to synopsize it in the style of Nocenti’s breathless captions. So thanks for avoiding that. Heh. Yeah, about halfway through the issue I realized this was definitely going to get more of a high level summary. The kids being depicted in black-and-white until the end confused me, too, since contrary to what I assumed for most of the story they didn’t turn out to be aliens or psychic manifestations or something like that. That was an odd choice. It definitely created the impression there was more to the kids than what we were seeing. Nocenti isn’t wrong but she’s awfully earnest. Well said. That earnestness is very grating. That's one of the big problems. Other than being teenagers, there's really no reason to use the New Mutants in this story. 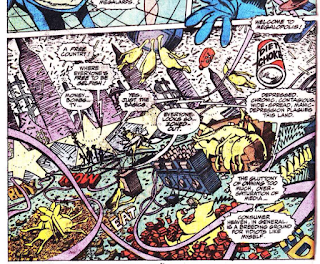 And even in the story, all they really do is run from one of Nocenti's thinly-veiled metaphors to another.